Thick black smoke has cloaked the Las Vegas Strip after a fire broke out on the roof of the luxury Cosmopolitan Hotel, near a pool decorated to resemble an oasis. The spectacular scene however seemed worse than it was, as just a few people suffered from smoke inhalation. One person was hospitalized after the fire engulfed the 14th floor Bamboo Pool at the Cosmopolitan Hotel Las Vegas. The fire started in a cabana surrounding the pool and spread at a lightning speed in 95 degrees Fahrenheit (35 degrees Celsius) weather. The oasis ‘trees’ had been made of high-density foam and plastic which burned easily and created a plume of black smoke, said Fire Chief Greg Cassell. “Once it got going, it jumped from tree to tree,” he said. The fire which had been reported at 12:16pm PST was extinguished by 12:47pm, Cassell said. One person was hospitalized for smoke inhalation while another one was treated at the scene, he added. The cause of the blaze is unknown, according to the Fire Department. A preliminary theory is that fire could have been started by a cigarette. 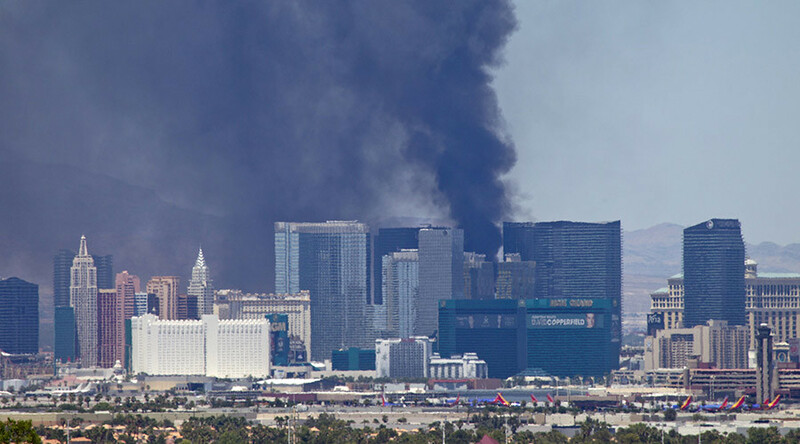 The fire caused the closure of the strip for about 45 minutes and created a panic among hotel guests, but offered a grand photo opportunity to tourists. Some of the hotel rooms suffered water damage, according to AP, with the14th and 15th floors of the hotel’s west tower declared off-limits until further notice. The Bamboo Pool is one of three pools at the Cosmopolitan and is described on its website as the “ultimate Las Vegas relaxation pool” in a “soothing environment with a private canyon-like feel.” Overall, the $3.9 billion hotel- resort consists of two high rise towers with nearly 3,000 rooms.